Ready for Kentucky Derby Hat！！！. 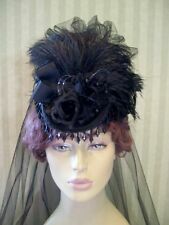 For your buying consideration is this Beautiful one of a kind mini riding hat with beaded trim, black ostrich feathers, black flowers and a black tulle bustle and train. What is a mini riding hat?. My mini riding hats sit perched ontop of your head not down on your head. The organza derby hat will be a perfect accessory for you to be the focus in the crowd. Hat top : flat top. 1 x lady hat. (Colors: Leopard grain. Materials: 100% Wool. We will get back to you within 24 hours! Refer to the size （56--58cm). Straw Hat Brim: Approx.15cm/5.9". Material: Straw. Color: Natural With Black Ribbon Tie. Item Type: Sun Hats. Hat Size: Height 5.5cm/2.2". New Woman Church Derby Wedding Sinamay Dress Hat. We will do our best to resolve those problems. 1 Piece Bowknot Fedora Hat. - Classic design with bowknot will make you so fashion, elegant and charming. - Material: Wool Felt. The product is new, never used and in good conditon, just go ahead and buy! 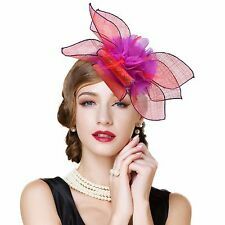 New Woman Church Derby Wedding Sinamay Dress Hat. We will do our best to resolve those problems. Head Girth is 22.5". Adjustable for the smaller fit. We will do our best to resolve those problems.